Aside from a OnePlus 5 release date, price, and of course our review, we decided to take the smartphone for a spin in terms of gaming performance. After all, it’s one of the first Snapdragon 835 SoC-powered devices to be made available in India, and the one with the most RAM at this point. One Plus 5 specifications include a Qualcomm Snapdragon 835 octa-core SoC clocking up to 2.45GHz, an Adreno 540 GPU, 6GB of RAM with 64GB storage (or 8GB of RAM with 128GB of storage), and a full-HD display (1920×1080 pixels). For the purpose of this piece, we checked out the 8GB RAM with 128GB storage version. While Samsung incorporated options to tweak with the Galaxy S8 and S8+ performance with a Game Mode, Game Launcher, and choices of resolution, the OnePlus 5 takes a more minimalist approach to the proceedings. Just two gaming-specific features exist: Gaming Do Not Disturb Mode and Dash Charge While Gaming. The former lets users select games to add to a Do Not Disturb list. This, as the name suggests, turns off notifications and other interruptions like accidentally pressing hardware keys, ensuring complete immersion. As for the latter, it lets the OnePlus 5 charge while playing games as fast as it would if it wasn’t. This isn’t just for gaming though: video streaming or GPS usage won’t impact charging either. As you’d expect, we checked out a host of graphically demanding titles. We started off with Asphalt 8, and were treated to lush visuals and gorgeous weather effects as well as detailed car models. Everything looked fantastic on the OnePlus 5 for most part, but we noticed that underneath the spectacle of god rays and lashing rain that made up Asphalt 8’s Iceland and Tokyo levels, the frame rate was less than satisfactory. There was a perceptible amount of slowdown that made it far from optimal. Dropping down the image quality to Medium rectified this. We hope that an update from Gameloft fixes this issue, since the Samsung Galaxy S8 and S8+ delivered smoother gameplay with less RAM and a comparable SoC, and the OnePlus 3T with last year’s internals and 6GB RAM was running the game just fine. Things looked better in Breakneck, a futuristic racer in the mould of the Wipeout series of PlayStation games. Not only does it look fantastic on the OnePlus 5, the performance held up even in the busiest of segments with enemies and effects galore. We had a similar experience with Warhammer 40,000: Freeblade. This shooter, based on the Warhammer 40,000 universe, looked good and played just as well despite high resolution textures and large numbers of enemies onscreen, making killing orcs and giant robots a smooth spectacle. The lag-free gameplay extended to Vainglory – the mobile equivalent to Dota 2. Visuals looked great while the frame rate was consistent. Our only grouse was the pre-applied scratch guard on the OnePlus 5 resulted in finer taps not being recognised, forcing us to tap harder than we’d like, before removing it altogether. An evergreen title on Google Play is 2013’s mobile release of PS2 monster hit Grand Theft Auto: San Andreas. The game comes with its own options for resolution, shadows, and reflections. 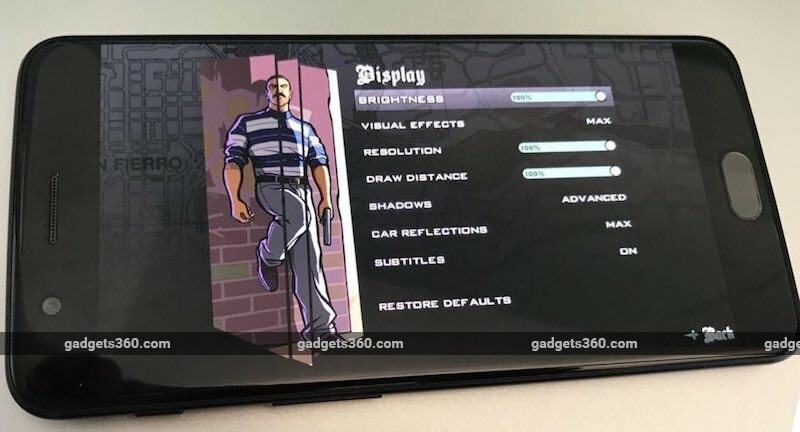 With 8GB RAM and the fastest SoC on the market, the OnePlus 5 almost succeeds where other phones do not – making Grand Theft Auto: San Andreas playable on the highest possible settings. But it’s not quite perfect. There’s the odd, infrequent drop in frame rate just to remind you that series creator Rockstar isn’t going to issue an update anytime in the near future, to optimise for modern mobile hardware. That aside, the specifications of the OnePlus 5 allow it to brute force the game, making for an enjoyable experience. Suffice to say, reducing the game to its default settings made this open-world epic a lot more fluid and responsive, and therefore the sweet spot for this title. Is the OnePlus 5 best for Android gaming? For most part, the OnePlus 5 seems to be more than a solid choice for gaming on the go. 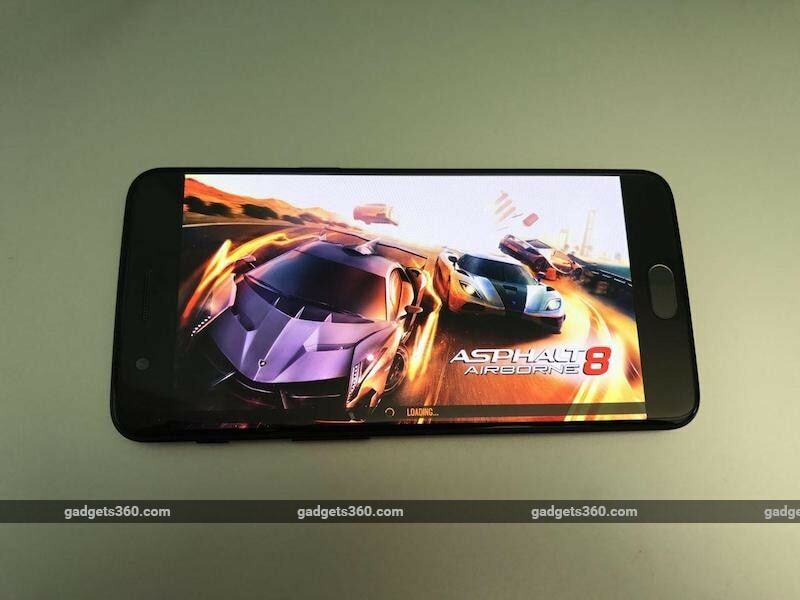 Asphalt 8’s performance remains an oddity. Hopefully it gets rectified in the weeks to come. What’s admirable is how the phone handles heat. Regardless what we threw at it, from the likes of Breakneck and Grand Theft Auto: San Andreas all the way to popular, network intensive fare like Clash Royale and Pokemon Go (which ran fine as they aren’t too much of a stress on most devices in terms of graphics) the OnePlus 5 rarely got warm. It might not have the edge to edge Infinity display of the Samsung Galaxy S8 and S8+, or its stunning screen, but the reduced bezels on the sides make for a more immersive experience compared to its predecessors.